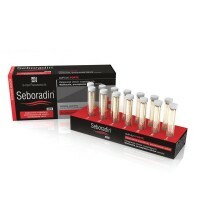 14 x SEBORADIN Anti Dandruff Anti Hair Loss Vials 5.5ml. Great dandruff treatment at home solution. English instructions will be included in package. Recommendations: Hair and scalp with dry or oily dandruff. For women and men. Contains dermosoft® dacalact, a natural-origin complex that inhibits dandruff formation through its antifungal and antibacterial activity. Willow extract has anti-irritation properties and prevents to oily hair. Tea tree oil has anti-inflammatory properties and inhibits microbial growth. Salicylic acid has exfoliating, antibacterial and antifungal properties. Pear extract and passion fruit extract are rich in fruit acids and protect against excessive follicular hyperkeratosis. Opuntia extract and honey increase hydration and form a protective film that prevents water loss from the scalp. Honey is particularly recommended for hair care as it gives a shine, deeply moisturises and improves the look of hair. Cocoa extract is rich in flavonoids, improves microcirculation and has anti-oxidative properties, thus strengthens the scalp and hair. This product in ampoules stops the development of Pityrosporum Ovale, a fungus that is the main cause of dandruff. The treatment effectively removes signs of dandruff and prevents its recurrence. It eliminates itching and soothes irritation, restores the normal microflora of the scalp. The efficacy was confirmed by an independent, specialist research laboratory – a self-evaluation test under dermatological control. How to use: Apply the contents of one entire ampoule onto the scalp and gently massage for about 2 minutes. Do not rinse! Scalp massage will improve blood circulation, strengthen hair, and improve absorption of active substances from the product. Daily application is recommended, in the morning or in the evening (depending on how often you wash your hair), on dry or washed hair dried with a towel. The product does not weigh down hair or make hair stick together. Visible effects of thetreatment after 7 days. 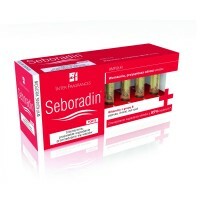 The treatment is recommended together with Seboradin Anti-Dandruff shampoo. The specific smell of the product comes from natural active plant extracts. This smell disappears after the hair is dried.